To many, reloading represents the ultimate method of increasing accuracy for their firearms, to others it represents a very cost effective means of obtaining greater volumes of ammunition to shoot. For a select few reloading is a time when they experience a form of peaceful serenity and effectively tune out the stresses and tribulations of everyday life. My uncle who taught me about reloading fell into that third group of people. He reloaded to get away from work, wife, kids, and basically was able to lose himself in meditation for several hours every so often. It was more than a science to him, it was a means to escape and focus on something that gave him peace, tranquility and satisfaction. I have inherited binders of loading data that my uncle used but found out that while he was very good at reloading he was not as thorough as I would have liked. A 3″ D-Ring binder loaded full of calibres, bullet weights, and trajectories. The problem was however that not anywhere did these loads indicate primers, powder type and mass/volume, nor even brass types. I had a binder full of very nice information that I could not duplicate. My solution? 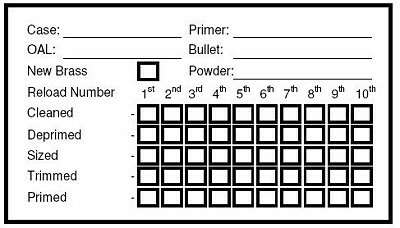 A reloading label as shown. I use them on every MTM case (and other bullet box) I own. Why bother you may ask? If, like myself, you reload for a dozen or more calibres and have different loads for each dependent on the purpose, suddenly you can have literally 30 to 40 different combinations. And as no two guns shoot identically, for each subsequent chambering of said calibres, you are adding another set of load data. Now if you are not planing for accuracy, and face it, 3-4 MoA is acceptable for most hunting out to 200m (roughly 18-24cm impact area), then a single generic load that shoots adequately is perfectly fine. Some however seek the elusive 1/4 MoA or better accuracy, and in some competitions, where brass is segregated by mass, brand, and number of times reloaded, then labeling loads becomes far more important. As you can see the reloading label I use includes all sorts of information that can be used by the most basic to the most advanced reloaders. For myself, I usually start with reloads #1-5 already filled in, as I seem to acquire a lot of range brass and who knows how many times it was shot. Feel free to use my label, or make one for yourself. A DIY Reloading Label – Tactical, Practical or Fantastical? This entry was posted on March 13, 2011 by M. Duynhoven. It was filed under Reloading equipment & supplies .